Today I'm sharing a few of the art activities that we've recently used with Otto (16 months). We have three of these activities/trays out at one time. We have paint (with brushes, textured wands, sponges) and often dot markers to use on the art easel which we keep outside. We also have a large blackboard outside that is fantastic for gross motor skills. All of these activities require close supervision. For art trays at this age I'm looking for activities that use the child's fine motor skills but also that involve lots of different textures and colour or contrast. For example pencils, chalk and beeswax crayons offer very different textural experiences. Small chalk board with coloured chalk and small duster. Beeswax crayons with white art paper. Self-inking animal stamps with white art paper - using a white easy-clean tray. First Pencils with white paper. Dot markers with white art paper- using a white easy-clean tray. Large ocean stickers with blue art paper - the stickers have the edging removed so the sticker is easy to peel off the paper. Large pet and farm stickers with green art paper - these stickers also have the edging removed. Dot stickers with white art paper. White chalk with black art paper - for an older child I might use a chalk pen. Black crayon with white art paper - for an older child I might use a black marker or even charcoal, this is all about making lines and the contrast of the black on white. We use a mix of wooden and plastic trays. The plastic trays are non-slip and are easy clean, they are good to use for wet practical life activities too. Sometimes Otto will do the activity in the tray but not always. We have been encouraging him to do his art activities on a bamboo placemat to protect the table, it's almost like using a work mat on the floor that it also helps to define the work area. We use two different sized wooden trays, they both have handles which is recommended for this age, the edges also prevent the materials from sliding off, the wooden trays comfortably fit A4 and A5 pieces of paper. I also like to change the colour of the art paper, I feel like it can make an old activity interesting or simply catch the child's eye. We are currently using stickers with real images (photographic images) of objects that Otto is already familiar with, typically animals or vehicles. Otto is going through a huge point and name phase and the stickers can be used as language work. Over the years I've collected a few sticker books and I've simply cut the stickers out and removed the white edging around the sticker, this makes it really easy for the young toddler to peel the sticker off. We usually buy dot stickers from the stationary store in long rolls in various size and colours. The dot stickers pictured here are from National Geographic. If you have a slightly older child you may also like to introduce pasting, cutting, hole punching or water-colour paints. You might enjoy a previous post Art Activities to Rotate (at 2 years). We are in the process of moving our children's bedrooms around and I've been looking for some fresh bedroom inspiration. There is always one thing that hits me when I look at Montessori rooms online and that's space. It's not about minimalism or KonMari, it's a simple, well thought out and ordered design. Above - this is very colourful but it still looks comfortable. This one is all about light. See how the room isn't full. Everything is at the child's level and there is room for the child to grow into the space. 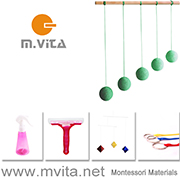 This is classic Montessori, so beautiful and comfortable. Love the art work! This space is clearly for the child. Lots of greenery too. This room looks fun. Jasmine does it so well. She has been writing about making Montessori spaces culturally relevant. This is so important, our spaces need to reflect who we are, what our values are, they shouldn't all look the same, you do you!! I'm sure these shelves are Ikea but see how personal this space is. Kitchen space with all the details. Simple, ordered, personal, calm, cozy. This is a homeschooling room but the feature that I'm noticing is the Schleich animals on the shelves. For an older child (3yrs+) this is a lovely idea. It keeps the animals ordered and accessible. I'm doing this in our next house! This room is all about the light, texture and natural colours. The low table next to the shelves is a great idea. This space is so calm and peaceful. This post includes images embedded from Instagram. If you are reading this via a blog reader or email you may not see all of the images, please click here to see the post in full. I love the Montessori approach to wall art. Nothing too busy, distracting or overwhelming. Just simple and beautiful. In children's spaces, I like to use images from nature. It's a part of the Montessori approach to expose the child to reality-based imagery but what is most important to me is that the images are inspiring, uplifting, captivating. I want for my children to see the possibilities of the world, to want to explore the earth, its lands, sky and, oceans. When Otis was a toddler we used the Bits of Intelligence cards for wall art. They are lovely, the background is white and the images really stand out. The card is thick and glossy (no need for glass in the frame). I love how they looked in Otis' Montessori room. But I ordered the cards from the US and had the frames custom made. I wish I could find the cards locally. So when we moved to the UK I printed some prints from Etsy, which were nice, you can see some here. But recently I came across the Learning Resources Snapshots. Have you used them? We only have the animal pack. I've tried similar cards previously and have been disappointed in the quality. These are essentially designed to be used like flash cards for critical thinking and language development. They have a series of questions on the back that the teacher (or parent) can ask the student to further discuss the images. But these cards are excellent quality, not only are they colourful, they are sharp and in focus. The cards are thick and glossy. There is 40 in a pack, which I think is affordable, and great value. But the images... they are all thought-provoking and diverse. What also makes these so affordable is the cards are 20 cm x 20 cm which mean they fit into a standard 8 x 8 inch frame, which I found easily and very cheaply. I had to slightly trim the cards to fit the frame but only perhaps 1-2mms. I think these are suitable for all Montessori environments, home and school. Pop in a frame and rotate every so often! Or let the children choose which images they would like to display. Otto adores the hippo (bottom centre card pictured above) so I think we will need to put that one out soon, or find another frame. They all have rounded corners (which you can't tell once they are in the frame) but they might look ok on the wall as they are. We also like to use postcards in a wooden frame or stand. There are lots of second-hand books with lovely vintage illustrations and calendars are also worthy of checking out, especially if they are on sale, these all can work well as affordable yet inspiring wall art. Why use an 'independent' high chair? Do you have a Tripp Trapp or similar high chair at home? We still had the baby seat attachment on ours and I found Otto trying to climb into it. It was so precarious. I wasn't sure what to do. Do I let him go and see if he can get in it? Do I tell him no and ask him to get down? I watched him try unsuccessfully to get into the high chair (with the baby seat attachment). It reminds me of how dangerous it is when young children climb in and out of their cribs. There is a better way. Today we removed the baby seat attachment and wow!! what a difference. Otto can now safely get in and out of his high chair. Not only did I remove the baby seat attachment I turned the top seat around (as it is supposed to be) and I lowered the bottom step so it is easier for Otto to get up and down. I googled Otis + tripp trapp and found that he started independently using his high chair at the same age! All three of my children have used the Tripp Trapp see Caspar (now 11yrs) and Otis (now 7yrs). Independence - the child can use independent thought to decide when to get in or out of the chair. Freedom of movement - the child is not contained and can move as they need. Child can sit with the family/eat at the same table - I love that these high chairs allow the child to participate in the family meal at the dining table. Otto will still use his low table and chair (or weaning table) for snack and often for breakfast and lunch. Pulls right up to the table - the child's plate can be on the same table as everyone else's, no need for a separate tray. Is respectful - the child is treated as an equal, they sit at the same height and eat off the same table as everyone else. Grows with the child - the seat and footrest are adjustable so can be moved to an ergonomic and safe position throughout childhood. Facilitates good decision making - the child learns freedom within limits and this allow them at this young age to learn boundaries and to act within those boundaries. Happiness and joy - Otto is much happier getting into and out of the chair himself, he is super proud of his achievements. Many Montessori families use a weaning table or a low table and chair until the child is old enough to sit at the dining table on an adult chair or booster seat and skip the high chair phase altogether. I completely get this but we love Otto sitting at the table with us and believe it provides so much!! a. / b. / c. / d. / e. / f. / g. / h. / i. / j. / k. / l. / m. / n. / o. / p. / q. / r. / s.
Otto loves containers and jars with screw top lids, he will use them repeatedly. We have lots of containers in his open and close tray but I have been thinking about nut/bolt and screw type toys. They are fantastic for developing coordination, concentration and very importantly wrist and hand strength. I've been looking everywhere for a large wooden nut and bolt (f.) that we've had previously. If you know where I can find one please let me know. I realised that Otto has a lovely olive wood nut cracker (g.) in his discovery basket. It almost has the same function don't you think? Montessori Nuts and Bolts (including a little about sequence) at The Montessori Notebook. Nuts and Bolts at Voilà Montessori. Nuts and Bolts at Montessori Album. I recently ordered Otto some cube puzzles and when they arrived I realised they were way too advanced for him. I couldn't find any that were simpler so I decided to DIY some! These puzzles are really quick and easy to make. They can be customised to the child's favourite shapes, colours and to their skill level. I used 12 untreated wooden blocks, they are 5cm cubed. I looked at a lot of different sized blocks but feel these were the best size. If I was in Brisbane I would have looked at Reverse Garbage which usually have heaps of cheap wood off-cuts. Ours were nicely sanded and smooth but this may be an extra step depending on your blocks. I decided to make three puzzles each with four blocks. But if you wanted to make it more difficult you could use more blocks, you could have six or eight blocks in one puzzle. I also used some painters tape, paint brush, pencil and some acrylic paint. I decided to make a triange, square and circle. I wrapped one long piece of tape around all four blocks to keep them tightly together. Then I used the tape to mark out the square and triange. I traced around a glass with pencil to make the circle. I already had the painters tape at home, it's so useful. Ours is from here (UK link). I pressed the tape down firmly to get a nice sharp edge. Once the tape was in place I painted the square and triangle. I painted the circle freehand, trying to say within the pencil outline. Once the paint was dry I carefully removed the tape, look at those neat edges! Now they are ready to be used. You could paint shapes on the other sides of the cubes but as Otto is still so young I wanted to keep the puzzles as simple as possible. I keep on thinking about the possibilities, you could paint stripes or large dots or even paint a landscape or animals or flowers. These are still too advanced for Otto so I'll put them aside for when he is ready, it's good to see his hands here for scale. Aren't these lovely for learning shapes but also visual discrimination. 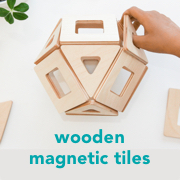 DIY Wooden Shape Puzzles at In the Playroom. Wood Blocks Puzzle Handmade Gift Idea at The Country Chic Cottage. There are a lot of really good board books for Montessori toddlers. But right now, with Otto at 16 months, there are two series that really stand out for me! If you have a toddler there is a good chance you have one of these books in your home. If you are a new parent or looking for a gift for a toddler, you can't go wrong with these. At this age (0-3 years) the child is trying to make sense of the environment and the life around them. So we offer not only books that are reality based but are relevant and familiar to the child's life and daily activities. "Books can be a big help if they are well chosen. We should check if they present reality... The reality is that of people, family and the environment in which they live, which they experience directly. Starting from this base they expand their knowledge." - Understanding the Human Being. For this reason we love books about birds, flowers, insects, farms or trucks (especially garbage trucks), or that contain babies or parts of the body. At 16 months Otto is in the locutory phase (12-20 months) and loves to point and name. Language cards could be used here but we are finding these simple books useful for this purpose. "There is a 'sensitive period' for naming things... and if adults respond to the hunger for words in an appropriate way, they can give their children a richness and precision of lanuage that will last a lifetime." - Silvana Montanaro in The Joyful Child. The child is wanting to know the names of things and books like these can help to satisfy that need. First 100 Books by Priddy Books. For a toddler I find the actual words on these books unnecessary but they do help the adult, it couldn't be easier for the adult to give the chid the name of the items. We have First 100 Animals, First 100 Words and First Farm Words. I am not sure if there are different US and UK versions, some words are not what we would use in Australia but it's easy to look past them. We also have First 100 Christmas words which was a hit at Christmas time. DK My First Books. I love that for the most part these have a white background and they give the names of the parts of the items, it just has a little more detail than the Priddy Books. Otto loves every single one of these, we have My First Things That Go, My First Trucks and My First Body. These not only allow the child to name the items but to put them into context. Babies love looking at other babies! While I adore these books, children obviously need story books too, these type of point and name books are just one type of book we can explose our children to. Another one of Otto's favourite books is A New Day, it shows the child going through their day and it has a real familiar tone, it shows the child's day from morning to night and it has lots of pictures of everyday life including sibilings who are building with blocks, going on a walk, parents cooking in the kitchen, reading a bedtime story, it's just lovely! Screen Time and Your Child's Development: A Montessori Perspective at Forest Bluff School, author Paula Lillard Preschlack. "This is key: our children will NOT learn to entertain themselves or calm themselves if their long, boring, or uncomfortable moments are filled with screen time or a digital toy. This is an incredibly important skill, one that comes front and center stage when children feel anxious, worried or self-doubting." In this article the author addresses many parental concerns and makes excellent recommendations. This is a FANTASTIC article for anyone new to Montessori on a budget or has a new baby. My Mostly Montessori Approach: 3 Months at Life is For Living. "The first thing I did was get Claire out of that bouncy seat. ""But the most impressive effect of the mirror was its impact on tummy time." A Montessori Baby Album!!!!!!! If an English version exists please email me! Found via Kathleen at Blog de Maman K.
This is a gorgeous Montessori bedroom - Tips to setup the perfect Montessori bedroom for your toddler at The Autism Cafe. This family also has experience with Asperger's and nonverbal Autism. This is a play kitchen but I love how they have customised the Ikea Duktig Kitchen at The Krauts. The photographs of this school are stunning, Keystone Montessori by Jamy Beecher Photography.